Charmeuse Silk Sleep Cap Adjustable (2214) 14"
Our Products >> Charmeuse Silk Sleep Cap Adjustable (2214) 14"
Providing protection for hairstyles and bedtime hair care routines with comfort. Comfortably accommodating growing hair, long hair, and high volume hair and hair styles without the 'shower cap' look. The elastics are adjustable, soft, and flat, and are encased in the silk so that only silk touches your hair and face. 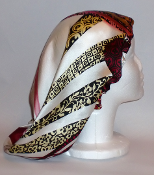 This cap drapes down and provides a flowing airy appearance and feel. Silk provides breathable, silky, protection while the adjustable elastic allows for the cap to fit just right every time. Directions: When you receive the product, look to the back inner seam, you will see a pocket where you have access to the elastic. You can reach in and untie the elastic and tie or stitch the elastic to your fitting. Wash Directions: Hand wash in warm water or machine wash on delicate and either air dry or dry on a delicate cycle. Night cap can be rolled in a towel and gently pressed to remove excess water (do not twist). Keep out of direct sunlight while air drying. Additional Information: Iron after washing for an extra silky smooth finish. The elastics do not have to be removed for ironing, but they can be removed and then looped back through the cap using a threading tool for drawstrings. Iron on medium setting(s). Do not use with appliances or heated tools. Fiber: 100% Silk. This product is made for adult use. Made in the U.S.A. Copyright © 2012-2019 Blensblend. All rights reserved.